Videos, solutions, and worksheets to help Grade 5 students learn how to find the area of triangles. 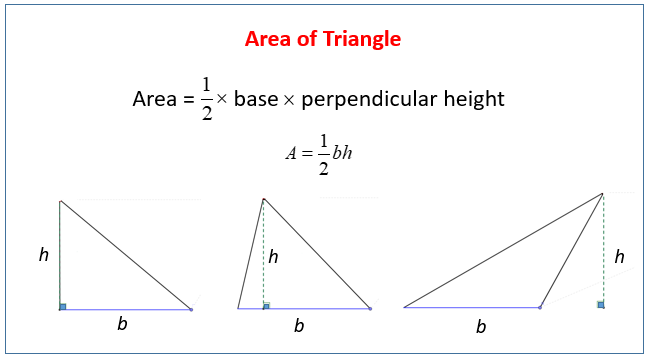 The following figures show how to find the area of triangles given the base and the perpendicular height. Scroll down the page for more examples and solutions. What is area? How to find the area of rectangles and triangles? How to determine the height of a triangle given the length of the base and the area? Find the area of the triangle given b = 7m and h = 8m. How to find the area of a triangle? The area of a triangle can be determined by multiplying half of the base by the height, as a triangle is essentially half of a quadrilateral shape. This video covers the process for finding the areas of rectangles, triangles and parallelograms.